Imaging of the human retina with high resolution is an essential step towards improved diagnosis and treatment control. In this paper, we introduce a compact, clinically user-friendly instrument based on swept source optical coherence tomography (SS-OCT). A key feature of the system is the realization of two different operation modes. The first operation mode is similar to conventional OCT imaging and provides large field of view (FoV) images (up to 45° × 30°) of the human retina and choroid with standard resolution. The second operation mode enables it to optically zoom into regions of interest with high transverse resolution using adaptive optics (AO). The FoV of this second operation mode (AO-OCT mode) is 3.0° × 2.8° and enables the visualization of individual retinal cells such as cone photoreceptors or choriocapillaris. The OCT engine is based on an akinetic swept source at 1060 nm and provides an A-scan rate of 200 kHz. Structural as well as angiographic information can be retrieved from the retina and choroid in both operational modes. The capabilities of the prototype are demonstrated in healthy and diseased eyes. W. Drexler and J. G. Fujimoto, “State-of-the-art retinal optical coherence tomography,” Prog. Retin. Eye Res. 27(1), 45–88 (2008). E. A. Swanson and J. G. Fujimoto, “The ecosystem that powered the translation of OCT from fundamental research to clinical and commercial impact [Invited],” Biomed. Opt. Express 8(3), 1638–1664 (2017). S. Makita, Y. Hong, M. Yamanari, T. Yatagai, and Y. Yasuno, “Optical coherence angiography,” Opt. Express 14(17), 7821–7840 (2006). T. E. de Carlo, A. Romano, N. K. Waheed, and J. S. Duker, “A review of optical coherence tomography angiography (OCTA),” Int. J. Retina Vitreous 1(5), 5 (2015). D. Ferrara, N. K. Waheed, and J. S. Duker, “Investigating the choriocapillaris and choroidal vasculature with new optical coherence tomography technologies,” Prog. Retin. Eye Res. 52, 130–155 (2016). J. Wang, M. Zhang, T. S. Hwang, S. T. Bailey, D. Huang, D. J. Wilson, and Y. Jia, “Reflectance-based projection-resolved optical coherence tomography angiography [Invited],” Biomed. Opt. Express 8(3), 1536–1548 (2017). 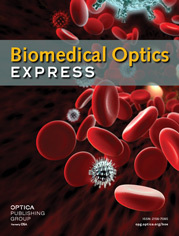 C. L. Chen and R. K. Wang, “Optical coherence tomography based angiography [Invited],” Biomed. Opt. Express 8(2), 1056–1082 (2017). M. van Lookeren Campagne, J. LeCouter, B. L. Yaspan, and W. Ye, “Mechanisms of age-related macular degeneration and therapeutic opportunities,” J. Pathol. 232(2), 151–164 (2014). A. Biesemeier, T. Taubitz, S. Julien, E. Yoeruek, and U. Schraermeyer, “Choriocapillaris breakdown precedes retinal degeneration in age-related macular degeneration,” Neurobiol. Aging 35(11), 2562–2573 (2014). I. C. o. Ophthalmology, “ICO Guidelines for Diabetic Eye Care,” (2017). M. Pircher, B. Baumann, E. Götzinger, and C. K. Hitzenberger, “Retinal cone mosaic imaged with transverse scanning optical coherence tomography,” Opt. Lett. 31(12), 1821–1823 (2006). M. Pircher, E. Götzinger, H. Sattmann, R. A. Leitgeb, and C. K. Hitzenberger, “In vivo investigation of human cone photoreceptors with SLO/OCT in combination with 3D motion correction on a cellular level,” Opt. Express 18(13), 13935–13944 (2010). R. S. Jonnal, J. Qu, K. Thorn, and D. T. Miller, “En-face coherence gating of the retina with adaptive optics,” Invest. Ophthalmol. Vis. Sci. 44, U275 (2003). R. J. Zawadzki and D. Miller, “Retinal AO OCT,” in Optical Coherence Tomography: Technology and Applications, W. Drexler, and J. Fujimoto, eds. (Springer, 2015), pp. 1849–1920. R. S. Jonnal, O. P. Kocaoglu, R. J. Zawadzki, Z. Liu, D. T. Miller, and J. S. Werner, “A Review of Adaptive Optics Optical Coherence Tomography: Technical Advances, Scientific Applications, and the Future,” Invest. Ophthalmol. Vis. Sci. 57(9), 51–68 (2016). M. Pircher and R. Zawadzki, “Combining adaptive optics with optical coherence tomography: Unveiling the cellular structure of the human retina in vivo,” Expert Rev. Ophthalmol. 2(6), 1019–1035 (2007). M. Pircher and R. J. Zawadzki, “Review of adaptive optics OCT (AO-OCT): principles and applications for retinal imaging [Invited],” Biomed. Opt. Express 8(5), 2536–2562 (2017). Y. Zhang, J. Rha, R. Jonnal, and D. Miller, “Adaptive optics parallel spectral domain optical coherence tomography for imaging the living retina,” Opt. Express 13(12), 4792–4811 (2005). R. J. Zawadzki, S. M. Jones, S. S. Olivier, M. Zhao, B. A. Bower, J. A. Izatt, S. Choi, S. Laut, and J. S. Werner, “Adaptive-optics optical coherence tomography for high-resolution and high-speed 3D retinal in vivo imaging,” Opt. Express 13(21), 8532–8546 (2005). M. Pircher, R. J. Zawadzki, J. W. Evans, J. S. Werner, and C. K. Hitzenberger, “Simultaneous imaging of human cone mosaic with adaptive optics enhanced scanning laser ophthalmoscopy and high-speed transversal scanning optical coherence tomography,” Opt. Lett. 33(1), 22–24 (2008). F. Felberer, J. S. Kroisamer, B. Baumann, S. Zotter, U. Schmidt-Erfurth, C. K. Hitzenberger, and M. Pircher, “Adaptive optics SLO/OCT for 3D imaging of human photoreceptors in vivo,” Biomed. Opt. Express 5(2), 439–456 (2014). C. Torti, B. Povazay, B. Hofer, A. Unterhuber, J. Carroll, P. K. Ahnelt, and W. Drexler, “Adaptive optics optical coherence tomography at 120,000 depth scans/s for non-invasive cellular phenotyping of the living human retina,” Opt. Express 17(22), 19382–19400 (2009). Z. Liu, O. P. Kocaoglu, and D. T. Miller, “3D Imaging of Retinal Pigment Epithelial Cells in the Living Human Retina,” Invest. Ophthalmol. Vis. Sci. 57(9), 533 (2016). F. Felberer, M. Rechenmacher, R. Haindl, B. Baumann, C. K. Hitzenberger, and M. Pircher, “Imaging of retinal vasculature using adaptive optics SLO/OCT,” Biomed. Opt. Express 6(4), 1407–1418 (2015). Z. Liu, K. Kurokawa, F. Zhang, J. J. Lee, and D. T. Miller, “Imaging and quantifying ganglion cells and other transparent neurons in the living human retina,” Proc. Nation. Acad. Sci.USA Early Edition, 1–6 (2017). C. E. Bigelow, N. V. Iftimia, R. D. Ferguson, T. E. Ustun, B. Bloom, and D. X. Hammer, “Compact multimodal adaptive-optics spectral-domain optical coherence tomography instrument for retinal imaging,” J. Opt. Soc. Am. A 24(5), 1327–1336 (2007). D. X. Hammer, R. D. Ferguson, M. Mujat, A. Patel, E. Plumb, N. Iftimia, T. Y. P. Chui, J. D. Akula, and A. B. Fulton, “Multimodal adaptive optics retinal imager: design and performance,” J. Opt. Soc. Am. A 29(12), 2598–2607 (2012). Y. Jian, S. Lee, M. J. Ju, M. Heisler, W. Ding, R. J. Zawadzki, S. Bonora, and M. V. Sarunic, “Lens-based wavefront sensorless adaptive optics swept source OCT,” Sci. Rep. 6(1), 27620 (2016). M. Salas, W. Drexler, X. Levecq, B. Lamory, M. Ritter, S. Prager, J. Hafner, U. Schmidt-Erfurth, and M. Pircher, “Multi-modal adaptive optics system including fundus photography and optical coherence tomography for the clinical setting,” Biomed. Opt. Express 7(5), 1783–1796 (2016). J. Polans, B. Keller, O. M. Carrasco-Zevallos, F. LaRocca, E. Cole, H. E. Whitson, E. M. Lad, S. Farsiu, and J. A. Izatt, “Wide-field retinal optical coherence tomography with wavefront sensorless adaptive optics for enhanced imaging of targeted regions,” Biomed. Opt. Express 8(1), 16–37 (2017). M. J. Ju, M. Heisler, D. Wahl, Y. Jian, and M. V. Sarunic, “Multiscale sensorless adaptive optics OCT angiography system for in vivo human retinal imaging,” J. Biomed. Opt. 22(12), 1–10 (2017). O. P. Kocaoglu, T. L. Turner, Z. Liu, and D. T. Miller, “Adaptive optics optical coherence tomography at 1 MHz,” Biomed. Opt. Express 5(12), 4186–4200 (2014). M. Mujat, R. D. Ferguson, A. H. Patel, N. Iftimia, N. Lue, and D. X. Hammer, “High resolution multimodal clinical ophthalmic imaging system,” Opt. Express 18(11), 11607–11621 (2010). M. Bonesi, M. P. Minneman, J. Ensher, B. Zabihian, H. Sattmann, P. Boschert, E. Hoover, R. A. Leitgeb, M. Crawford, and W. Drexler, “Akinetic all-semiconductor programmable swept-source at 1550 nm and 1310 nm with centimeters coherence length,” Opt. Express 22(3), 2632–2655 (2014). Z. Chen, M. Liu, M. Minneman, L. Ginner, E. Hoover, H. Sattmann, M. Bonesi, W. Drexler, and R. A. Leitgeb, “Phase-stable swept source OCT angiography in human skin using an akinetic source,” Biomed. Opt. Express 7(8), 3032–3048 (2016). I. E. C. (IEC), “Safety of laser products,” in IEC 60825 (IEC,2014). J. Zhu, C. Merkle, M. Bernucci, S. Chong, and V. Srinivasan, “Can OCT Angiography Be Made a Quantitative Blood Measurement Tool?” Appl. Sci. 7(12), 687 (2017). R. S. Jonnal, O. P. Kocaoglu, R. J. Zawadzki, S. H. Lee, J. S. Werner, and D. T. Miller, “The Cellular Origins of the Outer Retinal Bands in Optical Coherence Tomography Images,” Invest. Ophthalmol. Vis. Sci. 55(12), 7904–7918 (2014). M. Salas, M. Augustin, L. Ginner, A. Kumar, B. Baumann, R. Leitgeb, W. Drexler, S. Prager, J. Hafner, U. Schmidt-Erfurth, and M. Pircher, “Visualization of micro-capillaries using optical coherence tomography angiography with and without adaptive optics,” Biomed. Opt. Express 8(1), 207–222 (2016). T. Schmoll, A. S. G. Singh, C. Blatter, S. Schriefl, C. Ahlers, U. Schmidt-Erfurth, and R. A. Leitgeb, “Imaging of the parafoveal capillary network and its integrity analysis using fractal dimension,” Biomed. Opt. Express 2(5), 1159–1168 (2011). M. Pircher, B. Baumann, E. Götzinger, H. Sattmann, and C. K. Hitzenberger, “Simultaneous SLO/OCT imaging of the human retina with axial eye motion correction,” Opt. Express 15(25), 16922–16932 (2007). J. M. Olver, “Functional Anatomy of the Choroidal Circulation: Methyl Methacrylate Casting of Human Choroid,” Eye (Lond.) 4(Pt 2), 262–272 (1990). I. Gorczynska, J. V. Migacz, R. J. Zawadzki, A. G. Capps, and J. S. Werner, “Comparison of amplitude-decorrelation, speckle-variance and phase-variance OCT angiography methods for imaging the human retina and choroid,” Biomed. Opt. Express 7(3), 911–942 (2016). K. Kurokawa, Z. Liu, and D. T. Miller, “Adaptive optics optical coherence tomography angiography for morphometric analysis of choriocapillaris [Invited],” Biomed. Opt. Express 8(3), 1803–1822 (2017). J. Polans, D. Cunefare, E. Cole, B. Keller, P. S. Mettu, S. W. Cousins, M. J. Allingham, J. A. Izatt, and S. Farsiu, “Enhanced visualization of peripheral retinal vasculature with wavefront sensorless adaptive optics optical coherence tomography angiography in diabetic patients,” Opt. Lett. 42(1), 17–20 (2017). B. Povazay, K. Bizheva, B. Hermann, A. Unterhuber, H. Sattmann, A. Fercher, W. Drexler, C. Schubert, P. Ahnelt, M. Mei, R. Holzwarth, W. Wadsworth, J. Knight, and P. S. Russell, “Enhanced visualization of choroidal vessels using ultrahigh resolution ophthalmic OCT at 1050 nm,” Opt. Express 11(17), 1980–1986 (2003). E. C. W. Lee, J. F. de Boer, M. Mujat, H. Lim, and S. H. Yun, “In vivo optical frequency domain imaging of human retina and choroid,” Opt. Express 14(10), 4403–4411 (2006). Y. Yasuno, Y. Hong, S. Makita, M. Yamanari, M. Akiba, M. Miura, and T. Yatagai, “In vivo high-contrast imaging of deep posterior eye by 1-microm swept source optical coherence tomography and scattering optical coherence angiography,” Opt. Express 15(10), 6121–6139 (2007). R. Told, L. Ginner, A. Hecht, S. Sacu, R. Leitgeb, A. Pollreisz, and U. Schmidt-Erfurth, “Comparative study between a spectral domain and a high-speed single-beam swept source OCTA system for identifying choroidal neovascularization in AMD,” Sci Rep-Uk 6, 38132 (2016). S. Hariri, A. A. Moayed, A. Dracopoulos, C. Hyun, S. Boyd, and K. Bizheva, “Limiting factors to the OCT axial resolution for in-vivo imaging of human and rodent retina in the 1060 nm wavelength range,” Opt. Express 17(26), 24304–24316 (2009). J. P. Kolb, T. Klein, C. L. Kufner, W. Wieser, A. S. Neubauer, and R. Huber, “Ultra-widefield retinal MHz-OCT imaging with up to 100 degrees viewing angle,” Biomed. Opt. Express 6(5), 1534–1552 (2015). A. H. Kashani, C. L. Chen, J. K. Gahm, F. Zheng, G. M. Richter, P. J. Rosenfeld, Y. Shi, and R. K. K. Wang, “Optical coherence tomography angiography: A comprehensive review of current methods and clinical applications,” Prog. Retin. Eye Res. 60, 66–100 (2017). Fig. 1 Overview of the compact swept source (SS)-OCT prototype system. (A) OCT interferometer configuration and beam propagation in the large field of view (FoV) imaging mode. PC polarization controller, PD photodiode, GS galvanometer scanner, FM flip mirror, DCC dispersion compensation component. (B) Scheme of the sample arm optics showing the beam propagation in AO imaging mode. The blue line shows the optical path of the OCT beam, the red line represents the light path of a guide star used for wavefront sensing. The dimensions of the sample arm housing are also specified. (C) Detailed beam propagation for the non-AO imaging mode. (D) Detailed beam propagation for the AO-imaging mode. Dich Mir. 1,2 dichroic mirrors, BS beam splitter, DM deformable mirror, SH Shack Hartmann wavefront sensor. Fig. 3 Images recorded in the right eye of a healthy volunteer (V1). A) True color fundus image acquired with a commercial instrument (45° × 45°). B) En-face image generated from volume data that was acquired with the wide FoV mode (45° × 25°) by depth integration over the entire A-scan. C) Single B-scan extracted at the location indicated with the yellow line in B). The entire data set can be viewed in Visualization 1. D) Averaged B-scan of 100 registered images that have been recorded at the location indicated with the yellow line in B). OCT B-scans are displayed on a logarithmic grey scale and the depth extension is ~4mm. Fig. 4 Images recorded with the AO mode of the instrument in the right eye of V1 (location is indicated by a red square in Fig. 3(B)). (A) Single B-scan extracted from a volume scan acquired with the focus set at the photoreceptor layer. (The entire data set can be viewed in Visualization 2). En-face images were generated by depth integrating the 3D data over the IS/OS (B), COST (C) and RPE (D) layers. (E) Single B-scan extracted from a volume scan acquired with the focus set at the inner retinal layers. (The entire data set can be viewed in Visualization 3). En-face images were generated from this data set by depth integration over superficial plexus (F), intermediate plexus (G), and the deep plexus (H), respectively. Fig. 5 Angiographic images recorded in V2 with the large FoV mode (45° × 25°). (A) B-Scan showing the calculated phase variance within four B-scans in red overlaid to the OCT intensity image (linear gray scale, average of four images). The entire data set can be viewed in Visualization 4. (B) En-face image generated by depth integration over the inner retina. (C) Composite false color image of the phase variance in different retinal layers (inner retina (cyan), choriocapillaris (magenta) and laminar cribrosa (green)). Fig. 6 Angiographic images recorded in V2 with the medium FoV imaging mode (27°x13°). (A) Composite B-Scan showing the OCT intensity in linear grey scale and the calculated phase variance in red. The entire data set can be viewed in Visualization 5. (B) En-face image generated by depth integration of angiographic data over the superficial plexus and the deep plexus. (The red square in (B) indicates the region of interest that was imaged with the AO-OCT imaging mode). Fig. 7 Angiographic images recorded in V2 with two different imaging modes (medium FoV mode and AO-OCT mode) at a location indicated with the red square in Fig. 6 (B). (A) Composite B-scan extracted from the data of Fig. 6 showing the OCT intensity information in gray scale and the phase variance in red. The depth extension of the different layers for en-projection are indicated by the letters C-D-E. (B) Composite B-scan recorded with the AO-OCT mode with the focus set at the inner layers. The intensity information is displayed in grey scale and the phase variance is displayed in red. (C-E) En-face phase variance images of the region of interest extracted from data of Fig. 6 of the superficial, intermediate and deep plexus, respectively. (Note that these images are enlarged views of the data presented in Fig. 6) The entire data set can be viewed in Visualization 6. (F-H) En-face images of the phase variance recorded with the AO-imaging mode by depth integration over the superficial plexus, intermediate plexus and deep plexus, respectively. The horizontal yellow line indicates the location of the B-scans. Fig. 8 Images recorded with all three imaging modes in the left eye of V3. (A) En-face image recorded with the large FoV mode and generated by depth integration along the entire A-scan. (The red square indicates the region of interest and corresponds to 3° × 2.8° at an eccentricity of ~7.5 degrees from the fovea). The inset represents an en-face image recorded with the AO-OCT mode and was generated by depth integration over the IS/OS layer. (B) En-face image generated from the medium FoV mode by depth integration of OCTA data posterior to the RPE. (C) Composite image of OCT B-scan intensity information in linear gray scale and the phase variance in red of the medium FoV mode. (D) Composite AO-OCT B-scan with the focus set at the photoreceptor layer displaying the OCT intensity on a linear grey scale and the phase variance in red. (The entire data set can be viewed in Visualization 7) (E) Enlarged view of the region indicated by the purple square in (B). (F) En-face image generated from AO-OCT data by depth integration over a shallow slab (10 pixels) posterior to the RPE. (G) Image data from (F) after applying a Gaussian blur filter (3pixels). Fig. 9 Images recorded with the large FoV mode in a patient with geographic atrophy. (A) Central B-scan showing the atrophic zone on the left half of the image. (B) Flattened central B-scan with angiographic information overlaid in red. (C) En-face image generated by depth integration of the volume data posterior to RPE/Bruch’s membrane. (D) The same en-face image as shown in (C) with the angiographic information overlaid in red. (The yellow square indicates the region of interest that has been imaged with AO-OCT- cf. Fig. 10). (E) Composite image generated by angiographic evaluation of the data visualizing vasculature of the inner retina (cyan) and choroid (magenta). Fig. 10 Images recorded in a patient with geographic atrophy in the region of interest indicated in Fig. 9(D)). A) Composite B-scan recorded with the large FoV mode showing OCT intensity and angiographic information overlaid in red (enlarged view of the region of interest approximately corresponding to the location displayed in C). The white arrow indicates the border between atrophic and non-atrophic region. The numbers 1 and 2 indicate two vessels. B) Corresponding en-face projection over the depth extension of choroid of the large FoV data. C) Composite B-scan recorded with the AO-OCT imaging mode. The numbers 1 and 2 indicate the same two vessels that are displayed in A). The red arrow indicates a location without larger choroidal vessels. D) En-face projection of AO-OCT data (over the depth extension of choroid).